We’re entering the heat of the summer and there are two traditions you can count on in Wichita in July: fireworks and baseball. In addition to the professional Wichita Wingnuts baseball team, Wichita is home to a vintage baseball club that brings a circa 1870s hardball experience to Old Cowtown Museum and the summer collegiate national championship played at historic Lawrence-Dumont Stadium. Catch vintage baseball, minor league baseball and fireworks in Wichita during the Fourth of July weekend. Later in the month, the 82nd annual National Baseball Congress World Series gets underway. The finale of the Bradley Fair Plaza Summer Concert Series lands on Thursday, June 30, this year and organizers are pairing a free concert by professional soul-jazz trumpeter Lin Rountree with fireworks over the lake at the outdoor shopping, dining and entertainment destination. This family-friendly concert starts at 7:30 p.m. Bring your own lawn chairs to sit on the plaza near the band or bring a blanket and find a grassy spot anywhere around the lake. The concert is free and open to the public; soft drinks and cocktails are sold on-site. The music ends around 9:30 p.m. and then a fireworks show will illuminate the sky over the Bradley Fair lake. Party like it’s 1875 during Celebrate America at Old Cowtown Museum. This old-fashioned Fourth of July celebration includes carnival games, sack races, a petting zoo, a parade, a free ice cream social, an appearance by the Fort Riley Commanding General’s Mounted Color Guard and more. The museum’s usual cast of costumed interpreters will be there to show what life was like just off the Chisholm Trail during the 1865-1880 timeframe. Old Cowtown is a living history museum with 54 historic and recreated buildings among districts including a residential street, industrial and business areas, a trade area and the DeVore farmstead. On July 2, gunfights will be staged at noon and 3:30 p.m.; wagon rides also are available. Watch a live baseball game played with 1870s rules and uniforms at 1 p.m., when the Cowtown Vintage Base Ball Club organizes a game between the Wichita Bull Stockings and Topeka Westerns. Old Cowtown will be open from 10 a.m. to 5 p.m. on July 2. Admission: $7.75 (18 to 61), $6.50 (62 and older); $6 (12 to 17); $5.50 (5 to 11); free for children 4 and under and Old Cowtown Museum members. As a Blue Star Museum, Cowtown offers free regular admission to active-duty military and their families, including National Guard and Reserve, from Memorial Day to Labor Day. During the July 2 event, Cowtown is extending free admission to military retirees and their dependents. The baseball field at Lawrence-Dumont Stadium in downtown Wichita will transform into a stunt playground when the Nitro Circus Live makes a stop on its North American Summer Tour. Nitro Circus features action sports star Travis Pastrana and 30 other extreme athletes performing stunts using freestyle motocross, BMX and other contraptions with wheels. The show starts at 5 p.m. and tickets range from $19 to $79. Wichita’s official Fourth of July celebration is Red, White and Boom, a free block-party style event scheduled from 5 to 10:30 p.m. on the Hyatt Regency Wichita lawn, the Lewis Street Bridge and Water Street in downtown Wichita. Food trucks and a beer garden will be available all evening in front of the Hyatt Regency Wichita. On-air personalities from Connoisseur Media’s 97.1 Bob FM will play music until local dance band, The Astronauts, take the stage at 7 p.m. Fireworks over the Arkansas River will start at 9:45 p.m. and will be accompanied by music. In addition to fireworks over the river, there will also be low-level pyrotechnics fired from two barges in the river and two static displays on the west bank. The event is free and open to the public. It is funded by the volunteer-led, non-profit Wichita Parks Foundation and local sponsors, including presenting sponsor Freddy’s Frozen Custard and Steakburgers. Also on Monday in downtown Wichita, you can catch Wichita Wingnuts baseball for as little as $1 per seat at Lawrence-Dumont Stadium. Mondays are Kwik Shop Dollar Day: pick up a voucher at any local Kwik Shop to get $1 general admission or use the voucher to upgrade to a reserved seat at the ticket office. Tickets normally range from $6 to $15. There also will be select concession items for $1. First pitch for the Wingnuts’ game against the Laredo Lemurs is 6:05 p.m. The locally-owned Wingnuts are in their ninth season in the American Association of Independent Professional Baseball and have won a division title in each of the past five seasons. They averaged nearly 3,000 fans per game last year and hired Pete Rose Jr. as manager during the off-season. Stay in your seat after the game to see the Wichita Parks Foundation’s fireworks show over the Arkansas River. However, if you want to see the pyrotechnics and static displays, it’ll be better to exit the stadium and walk toward the river. The Wingnuts play 50 home games from May through August and all Friday home games include post-game fireworks. 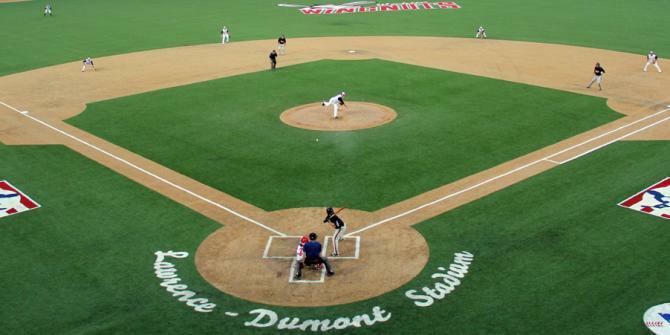 Thousands of young prospects and former major leaguers have played in the National Baseball Congress World Series, now in its 82nd year at Lawrence-Dumont Stadium. The list includes Satchel Paige, who played in the tournament’s first year in 1935, to Roger Clemens, Barry Bonds, Albert Pujols, Alex Gordon and many more. July 29 through Aug. 13 is your chance to see the next stars get their start. Twenty-two of the field’s 30 teams are from outside the Wichita area; teams are comprised of college-age and amateur players from across the country. Fans can watch as many as 60 games, including the infamous Baseball ’Round the Clock – up to 56 hours of consecutive baseball. Participants must register by July 31 to watch at least 12 consecutive games starting Friday, Aug. 5 through Sunday, Aug. 7. A small registration fee gives you a seat at each game and enters you in giveaways to win cash and prizes if you successfully check-in for each game during Baseball ’Round the Clock. Tickets for the National Baseball Congress World Series are on sale now. Season tickets starts at $80; individual session tickets start at $7.